About the technique in the picture..
That was not what you where supposed to say.. This kind of technique, together with over-stretching is one factor which led to my injury. It's not a relaxed position. I often see guitarists massaging their forearms after playing this way. I wouldn't recommend it, avoid it whenever possible. While some chords may seem easier to grab using this technique, you do not want to get used to it. It's just like with using your pinky. At first the 'right technique' seems hard, but when you get it, you'll be glad you're able to use it. This particular guitarist is probably just a part-time guitarist. There's nothing wrong with grabbing a chord in this way, now and than. But if you're playing hours upon each other, you'll put a lot of stress on your wrist and forearm. So make sure you'll be playing the guitar as comfortable and relaxed as possible. You've been paying attention, or at least know the best and most relaxed way to play the guitar! 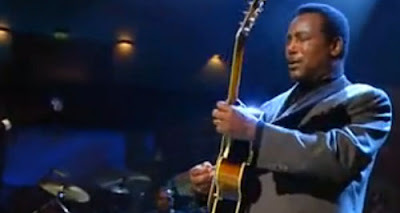 Watch this incredible performance of 'Lately' by George Benson, and pay close attention on how relaxed he plays his guitar. This man is great! Great and chill - as in - laying in a hammock catching a sweet summer breeze -chill. 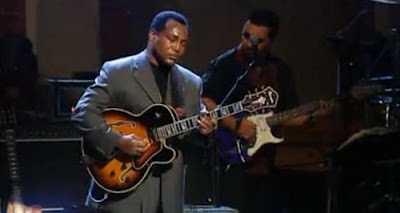 George Benson playing these advanced melodies. This is as chill as it gets! I'm just starting to learn - so I voted What's to see. Maybe I should tell you to click the links regardless of what you voted. There's some hidden booty under one of them ^_^"
At least, if you like it. Yay, I got it right! Going to check out the other links now. I had no idea haha, not a guitar player myself! His fingers need to be closer to the frets. I voted correctly, but I thought that it was just about the fingers needing to be closer to the fret (body side) when playing. It'll make the sound when played there in the middle, but it won't sound as good. Don't think that a skilled guitarist would do it like that but it's not a devastating mistake. Now you say so. That ring-finger is almost on the iron. Good catch. But it's really more about the 90 degree angle his hand makes to his forearm. Although a straight line isn't always possible, 90 degree is far from desired. Also annoying poll now I noticed it sends you away from the site. i used to play when i was little, but havent tried in years. baybe i should take it up again. I've no idea, but it's sound good!